Announced alongside the Cyber-shot DSC-RX100 IV premium compact in July, the update to the hybrid RX10 II similarly features a new 20-Mpix one-inch type “stacked,” back-illuminated (BSI) CMOS sensor. While the pixel count remains unchanged in this model, the new sensor design separates the light-sensitive layer of photodiodes, or sensels, from the supporting circuitry, which has been relocated to a layer beneath. The benefits of this new stacked design are increased pixel size (and therefore potentially increased light-gathering capabilities) as well as more room for additional electronics — and with that comes several additional benefits. For instance, the extra room allows for high-speed circuitry incorporating DRAM, resulting in a physically close buffer, which in turn allows for such new features as high bit-rate 4K (UHD) video capture (up to 100 Mbps), albeit with 5-minute maximum clips (extendable to 29 minutes at lower bit-rates), and 960 fps 40x slow-motion recording. The new faster sensor readout also minimizes distortion due to so-called rolling shutter, and allows an accelerated maximum electronic shutter speed of up to 1/32000 sec. Other upgrades to the original model include a higher-resolution 2.35M-dot electronic viewfinder (up from the earlier 1.44M-dot panel) and a new higher continuous frame rate for stills at 14 fps (up from 10 fps). Like other recent Cyber-shot models, the RX10 II has built-in WiFi with NFC, allowing users to share images and remotely control the camera from either an iOS or Android device. 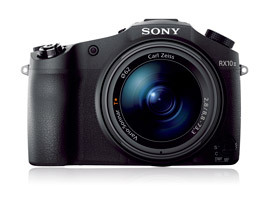 The RX10 II measures 5.1 x 3.5 x 4.0” / 129 x 88.1 x 102.2mm and weighs 1.79lb / 813g, body only. It is available now at $1,299 (USD). 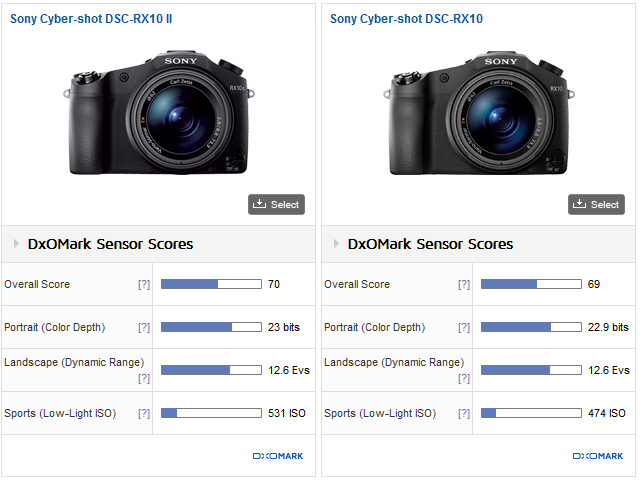 The Sony Cyber-shot RX10 II achieved an overall DxOMark score of 70 points, which is a good score and the same as the Cyber-shot DSC-RX100 IV, which seemingly shares a related sensor. Despite that, with a color sensitivity score of 23 bits and a wide-dynamic range score of 12.6 Ev, at base the new RX10 II performs very well — at least on par with the earlier class-leading back-illuminated designs. Compared with its predecessor, the RX10, the results are somewhat surprising given the new stacked sensor design. With less circuitry making way for larger pixels with a greater surface area (and therefore improved light-gathering capacity), the noise levels should be lower (at least that’s the theory). While the improved color sensitivity indicates lower noise levels, the difference of 0.1 bit might be noticeable in the lab, but it wouldn’t be in the field. Dynamic range at base is identical, but it’s important to make the distinction that the base setting is 80 ISO for the RX10, and 100 for the new model. Again, in the lab there’s some slight improvement over the earlier design at higher ISOs, but it is marginal. Still, given the benefits of the faster sensor readout, this remains quite a feat. Compared with similar “big-zoom” models from rivals using 1-inch type 20-Mpix CMOS sensors, the Sony Cyber-shot RX10 II sensor performance is a notch or two above. Against the closest in terms of outright specs and capabilities, the $900 Panasonic Lumix DMC FZ1000, the new Sony has at base ISO a +0.9-bit improvement in color sensitivity and close to an extra stop (0.9 Ev) of dynamic range, along with better DR throughout the ISO range. Although with a huge 24-600mm equivalent f2.8-5.6 optical zoom, the Canon PowerShot G3 X is arguably aimed at a slightly different market, at $999 it’s a convincing rival. Still, it lacks 4K (UHD) and the convenience of a built-in finder, but there’s no denying that the camera remains an attractive option. 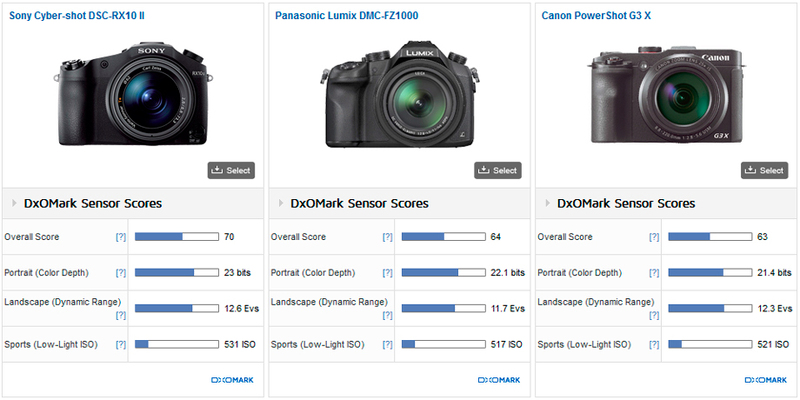 Sensor dynamics overall, however, are similar in most respects to the Panasonic. Despite the fact the G3 X has marginally lower color sensitivity, at least up to ISO1600, Canon has done well to leverage noise levels and improve dynamic range, which is mostly on par with the Sony. Although detractors may gripe about the lack of any real improvements in sensor performance over its predecessor, the new stacked-type back-illuminated sensor in Sony Cyber-shot RX10 II performs particularly well, given the advances from the high-speed readout. Such advances include high bit-rate 4K (UHD) recording, ”slo-mo” recording, and lowered distortion or skew effects from rolling shutter. While the design has allowed the addition of the necessary electronics, there has been no negative impact on sensor performance. In fact, the noise floor, color sensitivity and dynamic range remain more or less unchanged over its conventional back-illuminated predecessor.